What are the three laws of robotics and who created them? This is an introductory guide into the 3 robot laws and their associated rules. BASIC ROBOT RULES: This section explains who created the 3 laws of robotics and how robot law may, or may not, affect human beings. A robot must protect its own existence. This is as long as such protection does not conflict with the First or Second Law. When Isaac Asimov created the 3 robot laws, he also presented a true ethical dilemma. It is those in charge who decide the true meaning of 'human'. So they will order the programmers to program whom they consider to be human. Many societies, past and present, have marked some humans as sub-human. Thus, the robots would not see them as human. So the three robotic rules do not apply in this case. Note: To eradicate sub-humans, and protect humans, would be the programed (logical) thing to do. Experts define Artificial Intelligence as having the ability to have, or copy, human intelligence. As AI comes closer to a reality, some people worry about robots becoming 'self-aware'. This is evident in sci-fi movies such as the 'Terminator' film series and 'I Robot'. In fact, 'I Robot' specifically deals with a machine that becomes self-aware and does not obey the 3 laws of robotics. It does this by helping his creator commit suicide. These films are science fiction but it does not mean we cannot learn from theory and meet the fact on our terms. The word 'robot' was not coined by a scientist or even a science fiction writer. A Czech artist named Josef Capek first invented the word 'robot'. His brother Karel Capek was trying to come up with a name for a race of beings for a play he was writing. The 'race' were not metallic but biological beings created to do work for humans. Josef suggested 'robori' which Karel then used. Robori later became robot when the play got translated into English. The name of the translated play was 'Rossum's Universal Robots' circa 1921. Some people argue that 'robori/robot' means servitude, while others say it means slave. The fact is they are all right. Robori comes from an Old Church Slavonic word, rabota, which means servitude to labour. In turn robota comes from the word 'rubu' meaning slave. In everyday life we all come across robots. They are mostly used for good. They build the cars we drive. They give us money from an ATM. Robots arrange blood samples for testing in a way that a human could not. We use Law Enforcement Robots in extreme situations, such as bomb detection and suppression. The true 'dark side' is still Science Fiction - and it will probably stay that way. This basic article about modern information technology may scare many of you. But, I believe we can, and will, work out how to handle the future of robots. Even so, handling them will not be by sci-fi '3 Robot Laws', 'Robotic Laws', or by the 'Rules of Robotics'. It will happen by adopting the three laws of robotics into our own daily life. You can find robot rules in all the religions of the world. If you look close enough - you will find it! 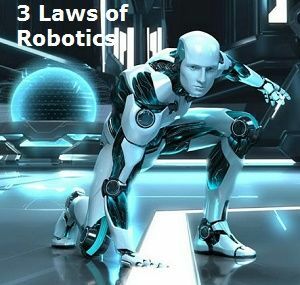 3 Robot Laws: What are the Three Laws of Robotics?